As a more unique promotional item, the garden and BBQ range have a lot of high quality products to offer. In this category we have everything you could need to have the most successful outdoor dining experience. We have compact BBQ's, ideal for taking to parks or friends and family's houses. There are also some spatulas and prongs made from sustainable bamboo, to show your companies commitment to the environment. The aprons in this collection would make brilliant gifts for restaurant staff, or for servers at hotels. These would make fantastic gifts for your employees and business partners, to show your appreciation. We even have printed bird houses! These would make well received gifts in themselves but can be made even more effective when used in gift bags, with similar items from our range. These could include dining wear and glasses. There's so much to choose from in this category, and they can all be customised by having your logo or slogan printed, for a personal and promotional touch. Be remembered as a unique brand by distributing promotional garden and BBQ products. Find almost any promotional products on the allbranded online store. Merchandise specifically suited to your niche or industry. This range of promotional DIY & Garden products is just the beginning if you are looking to expand your marketing campaigns an make them more effective. Being original is becoming harder and harder to do, especially for brands who want to stick in the minds of their customers. One way to do this is to give out more unique promotional items, giving these out during Spring and Summer will take advantage of how much happier people tend to be in Summer. The positivity that people experience during these warmer months of the year will then be associated with your business. By giving out personalised garden and BBQ merchandise, your clients will be able to enjoy grilled food as well as the sunshine, and be exposed to your branding at the same time. We offer compact BBQ sets, heat protecting gloves, cooling bags and a lot more practical items such as these. All items can be printed with your individual advertising message. Extend your advertising campaign by using these functional printed promotional products for your campaign. Allbranded have a huge variety of innovative giveaways and advertising classics. These will increase the effectiveness of your marketing campaign. 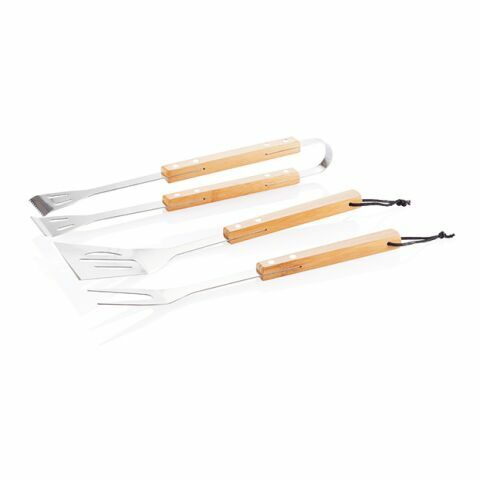 We have a garden set which features a foam knee pillow and a pair of gloves, we also stock luxury stainless steel BBQ tools which include a spatula and prongs. There are also several different BBQ’s, some foldable, others portable. No matter what product you choose, they can all be customised by having your logo printed on the front, to produce a strong advertising effect. Help bring a sense of Summer and alfresco dining to your customers lives with these promotional tools. Our team of experienced advertising experts helps you online or via phone, so that you can find the perfect promo gift for your success campaign. One of our absolute favourite garden and BBQ products has the be the logo printed knives that feature on our online shop! They are great as corporate gifts and can do wonders for your companies marketing and client retention campaigns. Leave your competitors behind with the use of original advertising utensils from our online store. Our innovative tools for garden and the practical BBQ utensils are efficient medium for communicating your advertising message. One of the greatest joys in the UK is the Summer BBQ, even if it may rain! The warmer weather only visits us for a short amount of time each year, so take advantage of that period by distributing promotional BBQ and garden merchandise to your customers and business partners. There are many opportunities to give these items out, for catering events or food themed festivals, music festivals, or for restaurants and street fairs. These items would also go well with others and could be part of gift bags. These could contain things such as the spice mills, or the knife sets. Why don't you surprise your target group with a BBQ? Your personalised products will make a strong marketing impact. We also offer many eco-friendly home and garden promotional products such as custom printed plants, as we are well aware that many of your target audiences will be environmentally conscious consumers! Show your clients your appreciation by distributing these useful garden & BBQ products as promotional giveaway's at your next event. We offer a huge variety of innovative promotional products for personalised marketing. Once you have chosen the right product for you, in your preferred colour, they can then be printed with your logo or a slogan. Trust allbranded to produce your high quality, customised merchandise. If you need any help with the design process, please don't hesitate to give us a call. Alternatively, you could open the live chat function at the bottom of the screen.